Editor: Ponzetti Jr., James J. 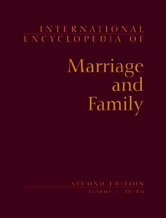 The second edition of the International Encyclopedia of Marriage and Family revises and expands Macmillan's 1995 Encyclopedia of Marriage and the Family, adopting an international, cross-cultural approach to such diverse topics as adolescent parenthood, family planning, cohabitation, widowhood, domestic violence, child abuse and neglect, codependency and commuter marriages. It includes articles specific to countries and to religious traditions, examining the history of family life within these cultures and discussing how families have been affected by political and social change.